Price: Free to download on Apple app store/Google Play With limited access & adverts. Premium upgrade – no restrictions or adverts : 1 instrument. 1 month $19.99, 1 year $119.99. All instruments (piano, guitar, bass, ukulele) : 1 month $29.99. 1 year $179.99. (All prices at the time of writing. Other currencies may vary). Monthly rates are recurring until cancelled. Guarantee – Apple may offer a refund – not guaranteed, so be careful. Google play for android may issue refunds within 48 hours. After that you will need to contact the developer. Check these links on how to get refunds for each platform. Try the free app before upgrading to premium is the answer. Requirements: piano or keyboard. PC, MAC, tablet or smartphone. A built-in or external microphone. What you get with the app? Free access gives you 20 minutes (including adverts sometimes 30 seconds long each) every 24 hours. Limited access to songs and lessons. Good for a beginner to get started. Premiums access gives you full access to over 1500 lessons, 100s of videos covering various skills including sight reading musical notation, theory and technique. Pros: Accountability – get instant feedback on your timing and technique. Colour coding of piano notes transitions into reading notation. Structured course content with the addition of song lists and challenges. Leaderboard of other users. Can be a fun learning process. Cons: Songs can sometimes seem corny. Settings may need adjusting to allow for delay in sound from your piano/keyboard. Difficult to use headphones – your tablet or PC will need to hear your instrument. Not for everyone, some may prefer traditional non-computer methods. Tends to be weighted towards pop and classical. Not as good value as other tuition material out there. Free version has annoying adverts and limited access. Lack of scope for advanced players. Suitable For: Beginners to intermediates – children, teens, adults. Yousician an app based platform that can be downloaded from their website, the apple app store or the google play site for android users. You can then access the content though your PC, Mac, tablet or phone once you have registered and chosen your desired instrument. If you are familiar with the computer game guitar hero, you may recognise the process and format of the app. For those not familiar, the lessons scroll from right to left with a bouncing ball that lands on a note with the idea that you hit the note on the piano at the same time. You won’t be required to read music initially, but this will be introduced and built upon as you progress. For the basis of this review, I will examine the premium subscription and whether it’s worth the upgrade. 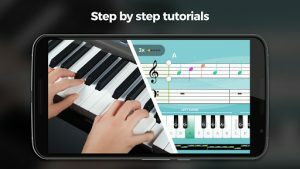 Before each song is played, Yousican asks the student to play the relevant notes on your piano or keyboard so the app can hear correctly – this is a kind of soundcheck. I had issues when I first played the app with a delay between me hitting the note and the app hearing it. This can be adjusted through the settings. All has been fine since this adjustment. The platform is split between missions, songs and challenges. The missions represent the main syllabus and backbone of the learning experience. This section also has a series of workouts split into scales, chords, technique and licks. A daily goal is shown which is aimed at the student achieving a minimum number of stars each day or setting a personal best for the amount of stars they can achieve. The stars are awarded after each lesson or song and provide an assessment of how well the student has performed. Although this is a little childish, it does work. Being assessed is a good measure of performance, which you won’t receive from learning solely from a book. Lessons and songs can be slowed down enabling the student to practice more difficult pieces until they become proficient. When you start the main Yousician syllabus, an introductory video shows you three notes – C, D and E, which leads into another showing you some tips on hand position and body posture. Then you dive into your first song using the three white notes. 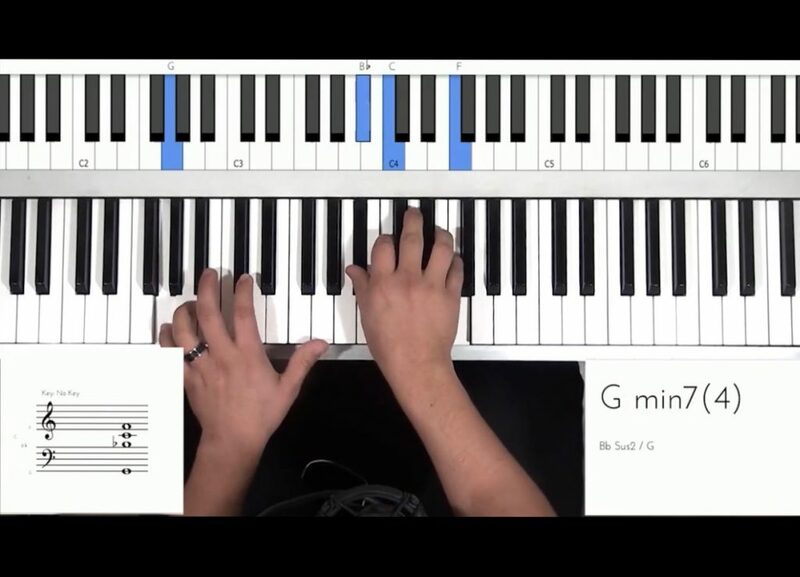 The keyboard is then explained in the next video and the section finishes with the student accompanying “Fur Elise” with the three notes that you have learned. The syllabus then branches off to three areas – Classical, knowledge and pop. The student can choose their path and come back to complete all three branches or study them alongside each other. The classical section starts by looking at the notes on the musical staff, followed by looking at different keys with a song example – Mary had a little Lamb. I said in another review, that I’m not a fan of learning children’s songs, but that’s just my taste. They have a purpose and get the student playing basic notes. Following that lesson, there is an assessment which will unlock the next level, providing you pass the test. You don’t have to be 100% perfect to pass and you have the opportunity to re-take the assessment and improve your score. There are 15 levels currently on my course. At the time of writing, I am up to level 6. 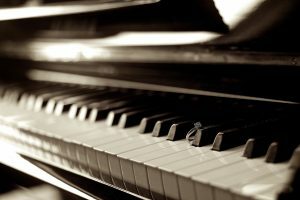 If you are an intermediate pianist, you can skip the content and go straight to the assessments to unlock each level. Looking ahead at the advanced sections, an intermediate player may have less scope to learn much from this course. The song section in Yousician has various pieces that can be learned, practiced and performed. When learning you can adjust the speed until you become adept. The performance of your song is assessed and scored, which gives you some motivation to improve your score. As with the lessons, if you make too many mistakes, the song finishes early. The song sections are split into different styles as well as a “top100”, “trending” and “hot” section. You will also find some workouts here. I tried an advanced version of Ave Maria and failed miserably. 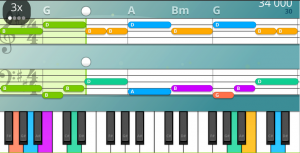 It struck me while attempting that when you try a difficult song, you don’t have the whole song in front of you (as in a piece of sheet music), due the scrolling process. Therefore when practicing, the ability to slow the piece down and (more importantly) using the pause button to get each bar under your fingers is advisable. This may not suit some students. What is clear is my poor standard of sight reading! This will improve with time. Challenges are small pieces for one or two hands with varying difficulty. They are placed on the app weekly, but you can try any by looking at the history. As with other lessons, there is the ability to practice and slow down the pieces to become proficient. I recently tried a blues piece that had a cool Pink Floyd feel with nice guitar solos in the background. The piece was available with just the right hand and two hands. After a couple of attempts I was ranked 452nd on the leaderboard! I had an email issue with the Yousician app – I had two emails assigned to my account, which caused problems with my log in. The team were quick to come back and corrected the issue. Good, attentive service in that respect. The teaching team deliver the course in a relaxed and professional approach, speaking slowly and clearly. 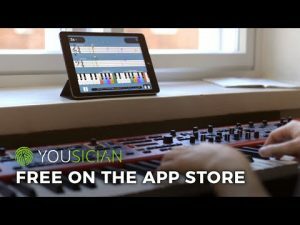 Yousician offers an interactive platform for learning the piano. It’s main strength is accountability and assessment. In effect you have a virtual teacher with you monitoring your technique (hitting the right notes) and timing. Be aware that the app is no substitute for a good human teacher who can also develop a player’s dynamics – their feeling, amount of pressure on the notes, fluidity etc. I do enjoy using the app, as I am a fan of computer games and gadgets. I find this technology useful and the arena is expanding – I will be reviewing similar courses in the future. Will you learn from Yousician? Certainly, although it appears the scope is limited when getting to an advanced level. It should take the beginner quite a while to get to that standard, so there are plenty of skills, techniques and songs to learn. Although you have the freedom to choose your path and choose songs and challenges, this may not work with everyone. Some may prefer a more rigid syllabus, but others may prefer this flexible approach. The daily goal is ok, although I don’t find myself achieving the goal every day. This approach may work for others – some days I just like to play without opening the app. I don’t think this will appeal to everyone – some may prefer more traditional methods. I’ve seen some reviews where the student struggles with the technology to work properly, but I’ve had no issues apart from tweaking the settings a little. The support is good and I’m sure they would respond to any difficulties. The cost of $19.99 a month is high and there may be better value out there. Saying that, trying the free version and maybe the premium for a month will not put you out of pocket by much. I wouldn’t advise subscribing for a year until you’ve had good experience of the app. Is the upgrade worth it? If you like the free Yousician app and feel that the course would benefit your learning, I think the upgrade is ok, but maybe for a short time. If you paid just $19.99 for one month you could progress quite quickly and then get a feel whether to continue. I like this flexibility. Remember to cancel your subscription and note you will be billed until the billing cycle has finished. Piano or keyboard. Weighted piano recommended . Web based system, so good broadband connection and Internet browser. Will work fine on PCs, Macs or Tablets. I use a Mac and IPAD with Safari. What you get as a member? Access to over 1000 videos including 50 lessons, how to play by ear, theory, finger exercises as well as the extra parts to songs (part 1 found on you tube). Pros : Huge catalogue of lessons and music, with no requirement to read music. No additional costs for songs as with other websites. Cons: Annual cost initially seems high, but, when broken down, it’s good value for the content available and very competitive compared to private lessons with a teacher. Review of Shawn Cheek’s Web piano teacher. Shawn Cheek offers a unique method of learning the piano without the need to read music. If you haven’t come across Shawn or his methods before, there are plenty of You Tube videos spanning quite a few years. He has song lessons, as well as theory, technique and sight reading videos. His general stance is to offer an introductory free video on YouTube and if you want to complete the song or lesson, you must subscribe to his website. His technique involves letters on a white board representing the required notes which are either individual or stacked upon each other to represent chords. At first you may wonder how he accounts for rhythm and note placement, but his tuition goes through this in detail. It’s a great method and gets you playing quite quickly. There is an exhaustive repertoire that covers for most tastes with varying abilities. Before joining his site, I was already comfortable with his teaching style and progressed quickly. When you are a member of the site and you log in you come to a dashboard, where you can save your favourite songs and lessons. At the bottom of the page is a category list where you can search for songs in a particular style e.g. There is also an educational category, which is a great starting point for the beginner or if you are new to the site. Here you will find an exhaustive section with over 150 videos. The 50 piano lessons are a good place to start and I have completed all of them. You can take these at your own pace, but with dedicated practice, you can progress quite quickly. An example of an early lesson looking at the C major scale. a series of 31 lessons teaching sight reading if you want to learn to read music. For any budding guitarists there are also 50 guitar lessons. A point to note, which is not a criticism, is there is a huge list of songs and lessons on the site. You must be focused on what you desire to learn, whether it is a particular song or lesson. I’ve found myself browsing the site, adding videos to my favourites and coming away with no playing. My advice is to set aside some time to simply browse and come up with a plan. When coming back to the song or lesson, don’t be tempted to wander off browsing again. This is true of any useful resource including You Tube. You could spend too much time browsing with less focus on playing or practicing. Support form Shawn is good. I once had a log-in issue and Shawn was quick to reply and fix the problem. If you have any particular song requests, Shawn is happy to receive them. A lot of material on the website has been requested by students. 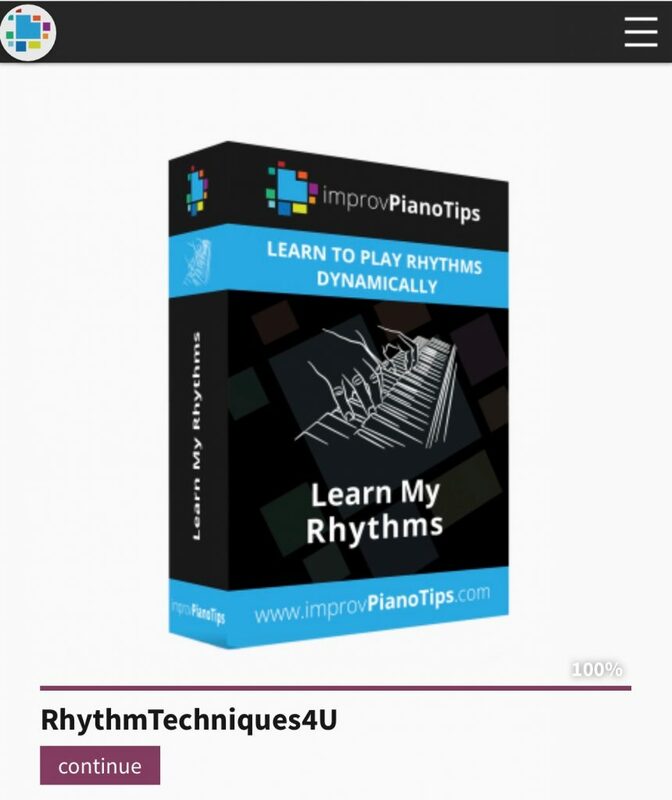 This is a great way to learn the rudiments of piano playing and learn songs quickly without the need to read music. The price may seem expensive up-front, but when you look at the content available it presents very good value. Shawn has a wealth of experience and has a teaching style that is informal but very effective. Transcriptions are accurate and his own arrangements of songs, demonstrating techniques and lessons are unique and will be part of your playing forever.